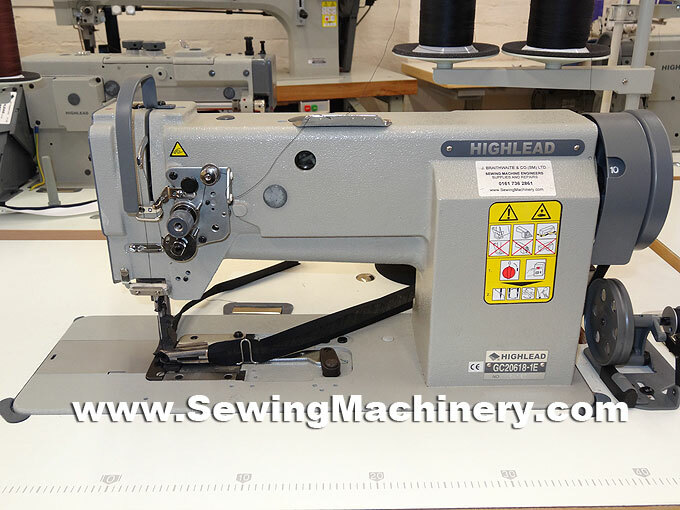 Highlead GC20618-1E-B10 heavy duty single needle lockstitch synchronized binder sewing machine. Featuring a heavy duty triple feeding action by way of: bottom feed, needle feed and walking foot top feed. These three different feeding components combine together to give a positive feed action which is well-matched to heavy/bulky material & fabrics. Highlead's industrial synchronized binder system moves an attached folding device in unison with the triple feeding action; to allow easy and precise edge binding with tape. 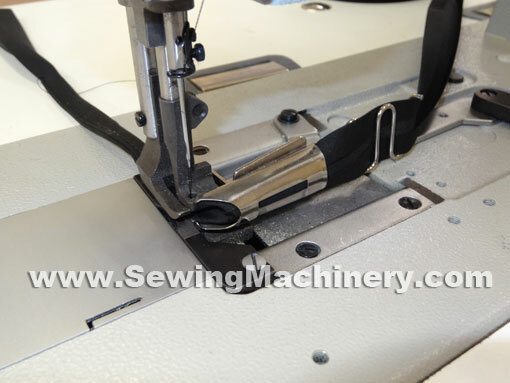 It is fitted with the advanced large vertical axis hook assembly & drive transmission: which can perform better when stitching with heavy duty materials and thicker sewing threads. As a dedicated binding machine the hook and base is fitted on the under left hand side to accommodate the flush fitting of binding equipment to the right of the needle and to allow easy unobstructed access for bobbin changing. Optional, or custom made, binding attachments are available for use with different binding tapes and material thicknesses. The GC20618-1E-B10 is a purpose built and dedicated synchronized binding industrial sewing machine ready for demanding industrial applications.